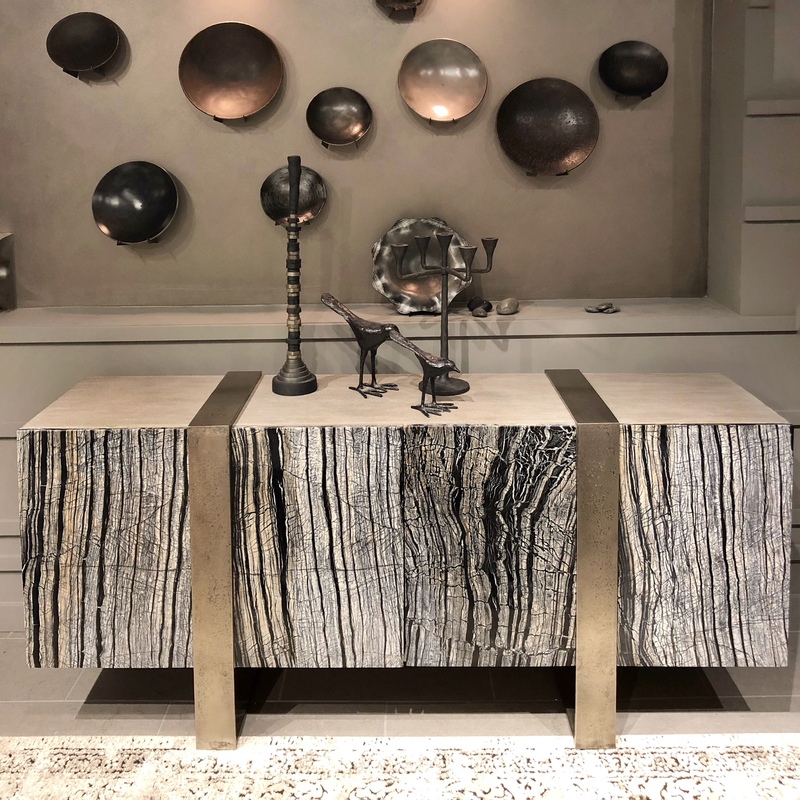 Every April I look so forward to traveling to North Carolina and seeing all the latest design trends from High Point Market. I take hundreds of photos and when I get home I pour over them to see what design trends I saw over and over that I can then share with all of you. 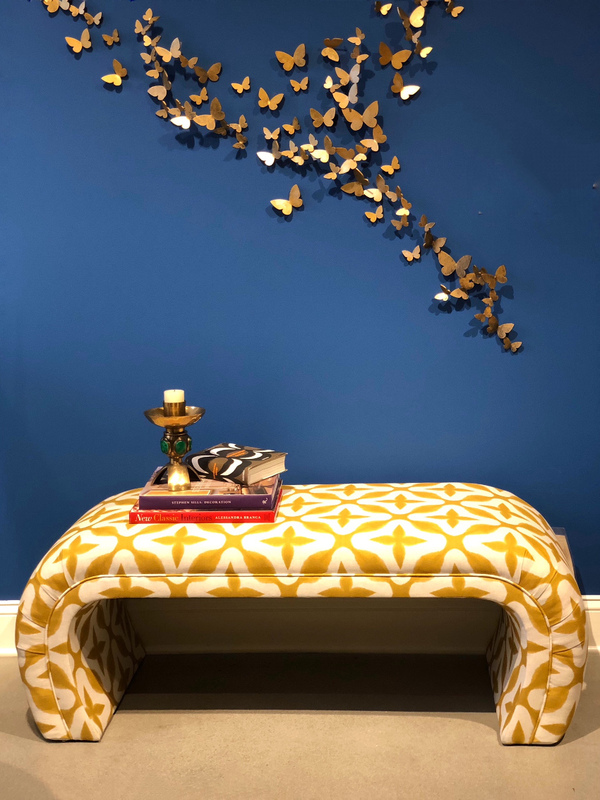 If you missed my first trend report on color, you can catch up with my Color Trends from High Point Market that I posted last week. 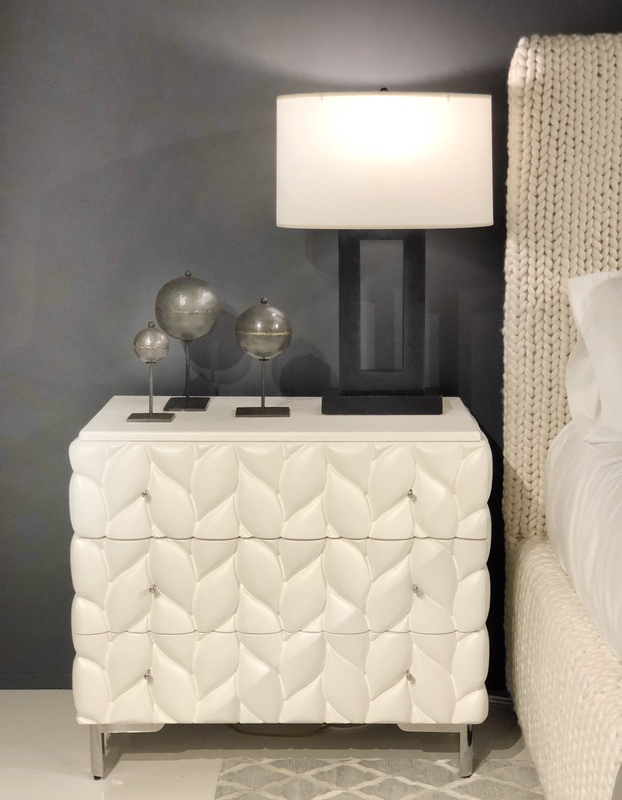 Today I’m giving you a sneak peak at five design trends from High Point Market that you will soon be seeing in your local stores. As with all my trend reports it is mostly photos. All taken by me of course! When is a chair more than a chair? 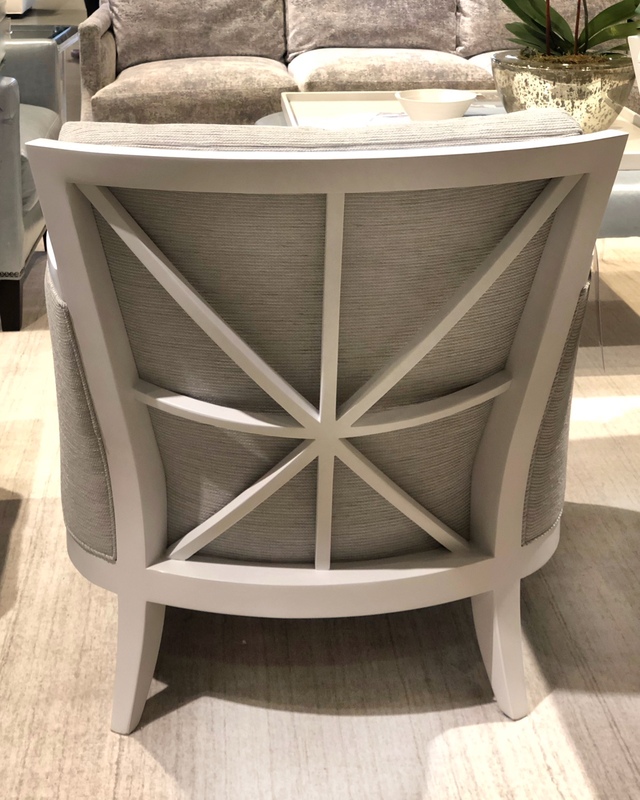 When becomes the center of attention in a room by shouting out, “Look at me!” While at Spring market I saw very few plain Jane chairs.So many were shown with a distinctive personality. The backs of chairs especially, were given extra style with embellishments ranging from leather to trim to embroidery. 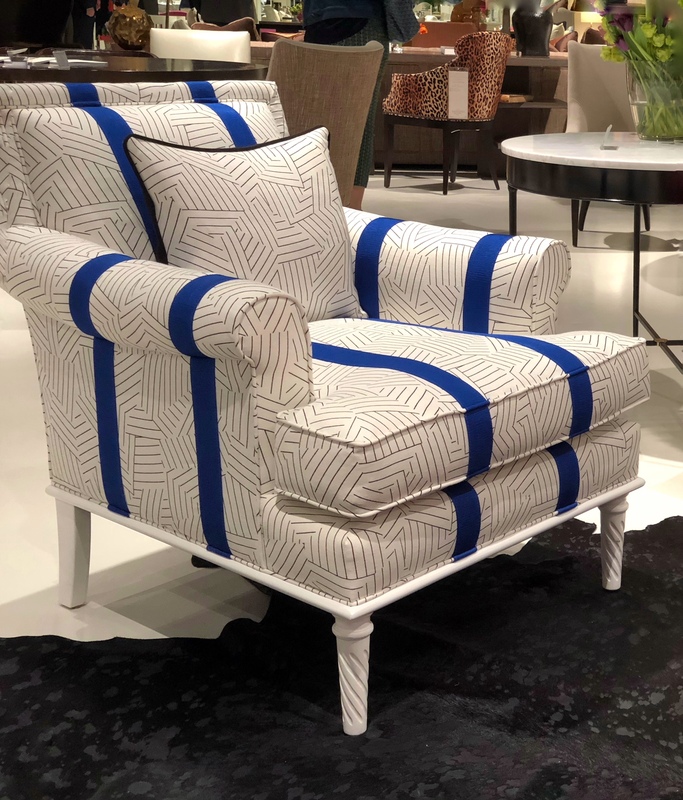 The blue trim on this chair adds a lot of flair to the black and white graphic fabric. It wasn’t that long ago that chair backs were simply “chair backs”. Chairs with interesting backs are a great option for open floor living where the chairs are floated and the backs are clearly visible. 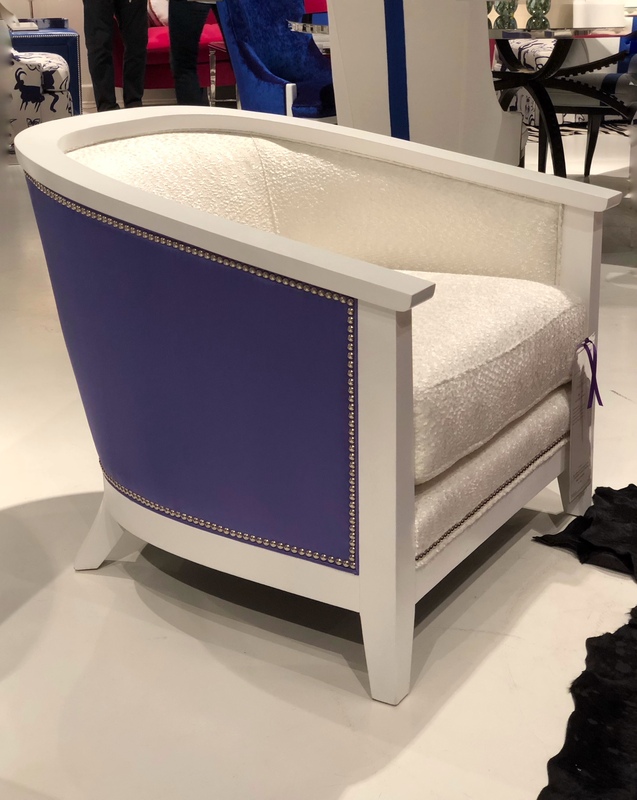 The purple leather and nail heads take this chair form plain to wow! 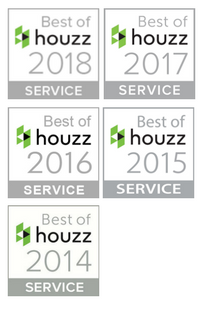 If I had to pick just one High Point Design trend as being impossible to miss it would be texture. 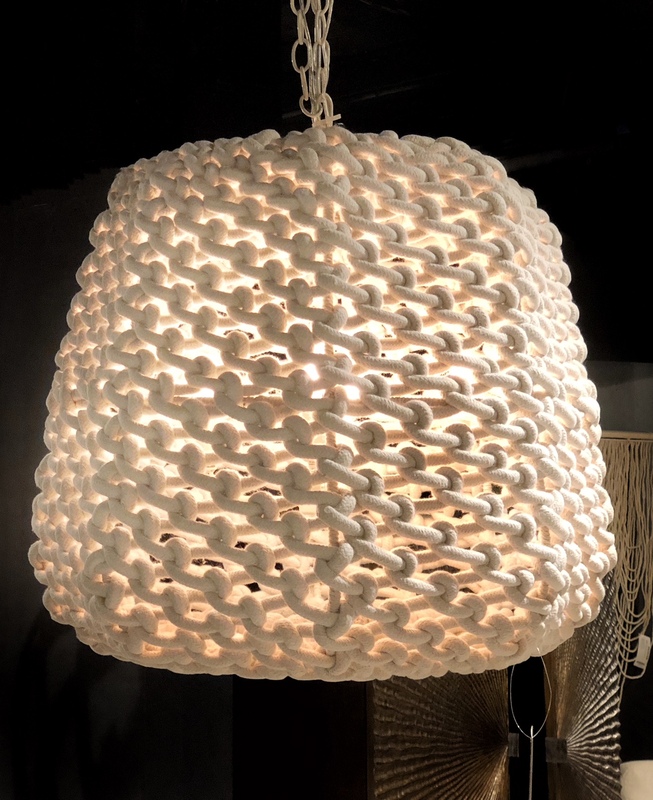 Everything from lamp bases to furniture to pillows were full of tactile, textural surfaces. 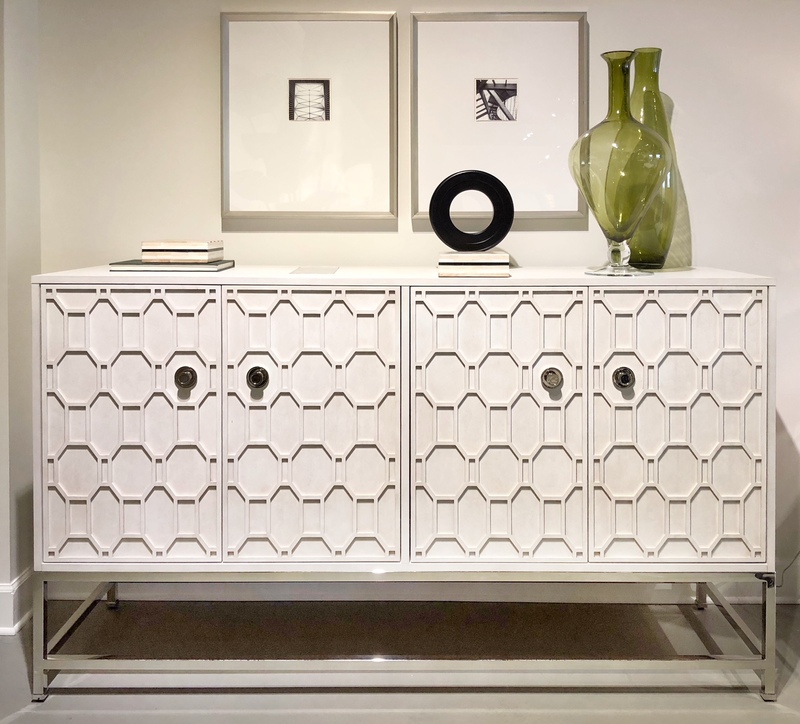 This “cable knit” chest of drawers was a showroom favorite. Notice too the matching cable knit bed! 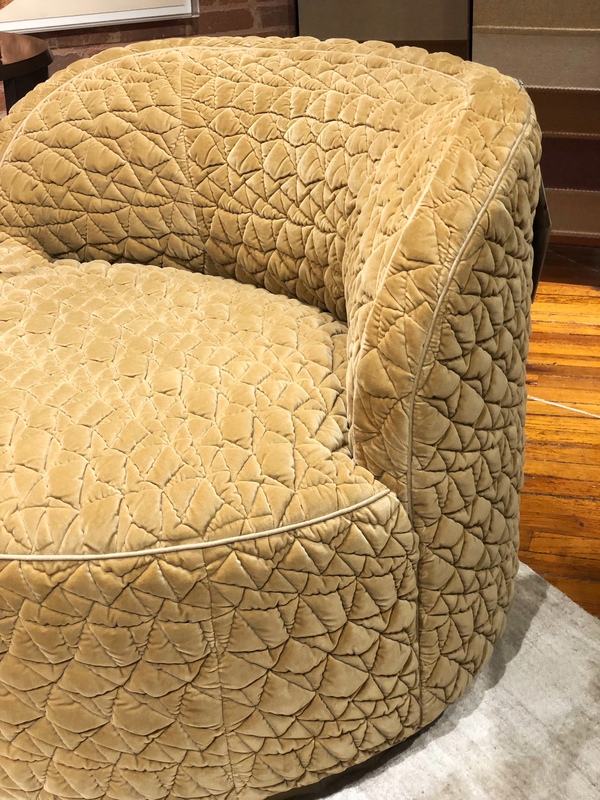 When I first saw the textured fabric on the chair below it kind of grossed me out but the more I looked at it the more I grew to like it. 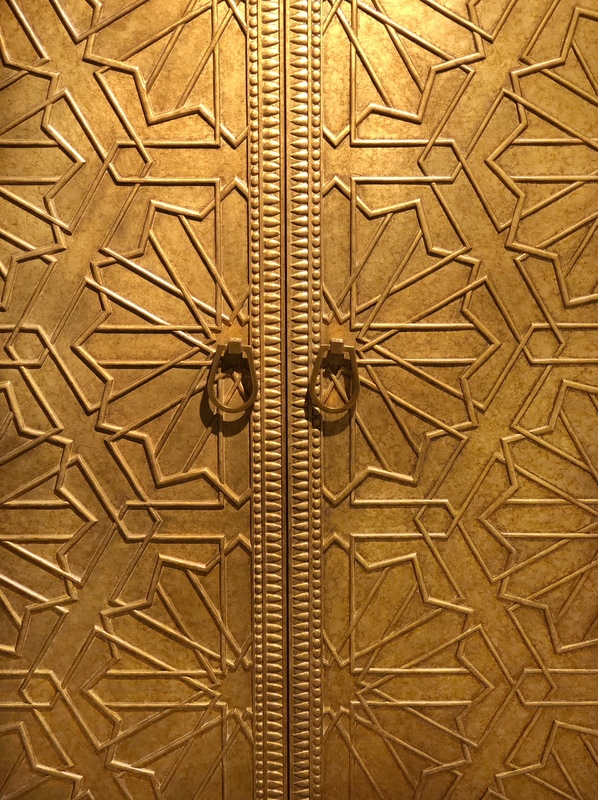 The most interesting use of texture was seen on wooden case goods. 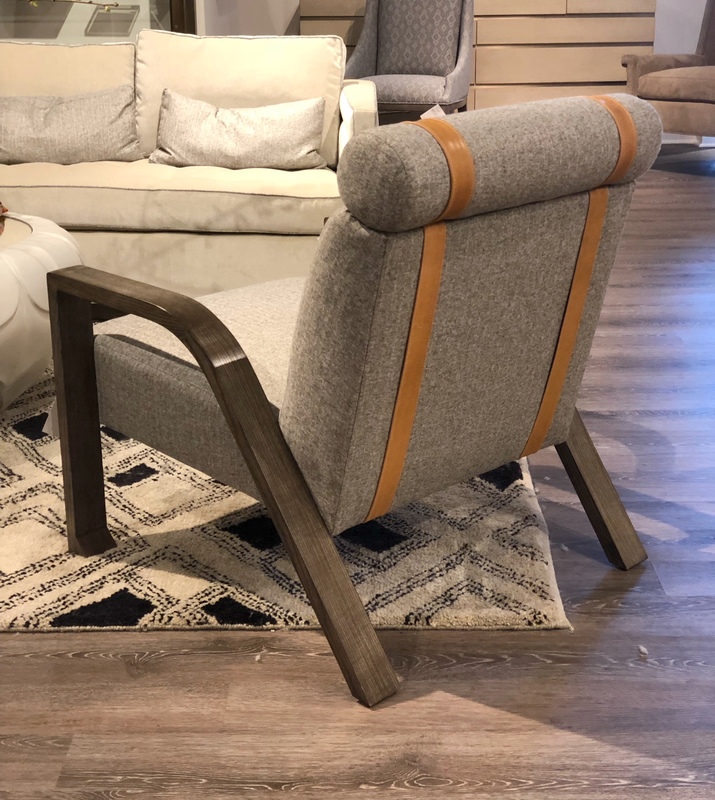 Soft curves and feminine lines were seen on so many of the new upholstery pieces this Spring. The curves had a modern feel and a clean lined look. 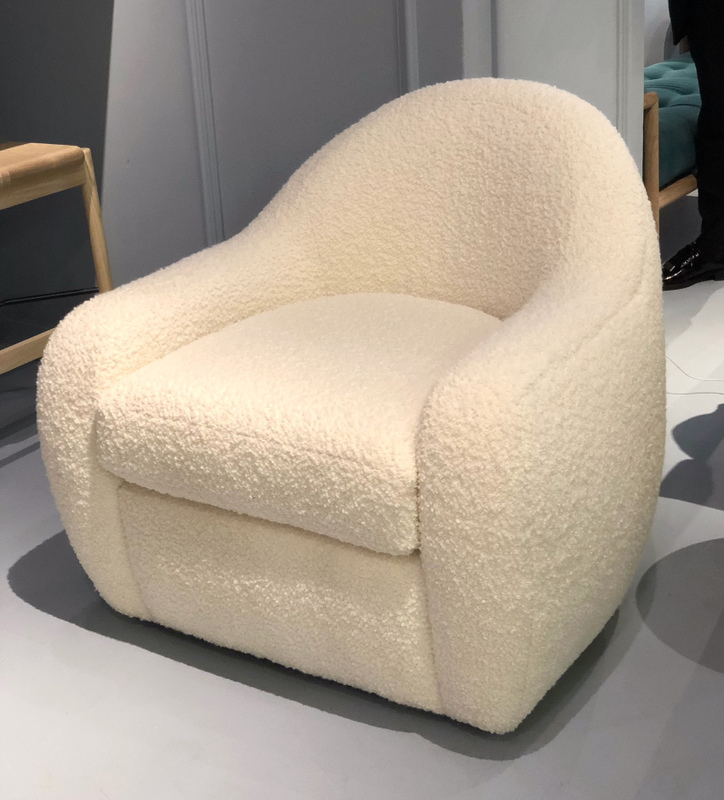 Shearling fabric was spotted all over Market on upholstery pieces. 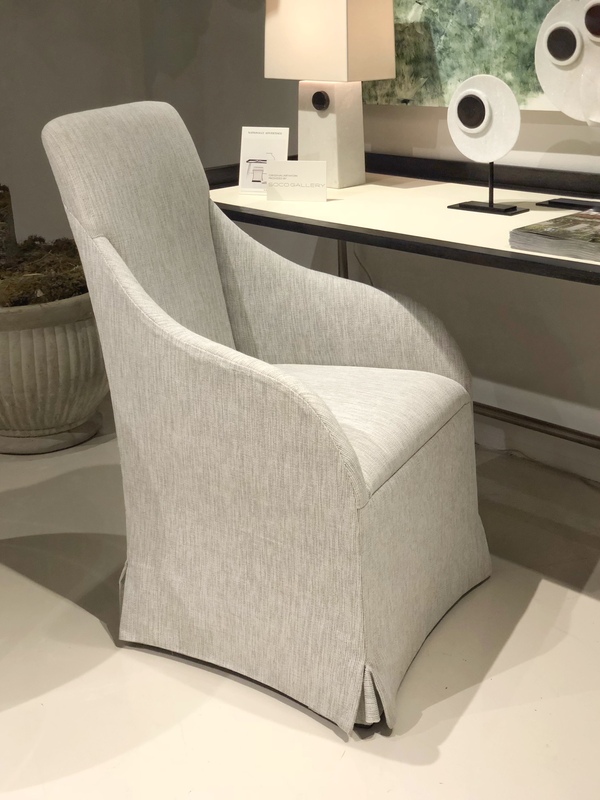 This chair below incorporates both the texture and the curved lines trend. I’m not sure how I feel about shearling. On one hand it looks so comfy but on the other hand I would guess it’s pretty challenging to clean. 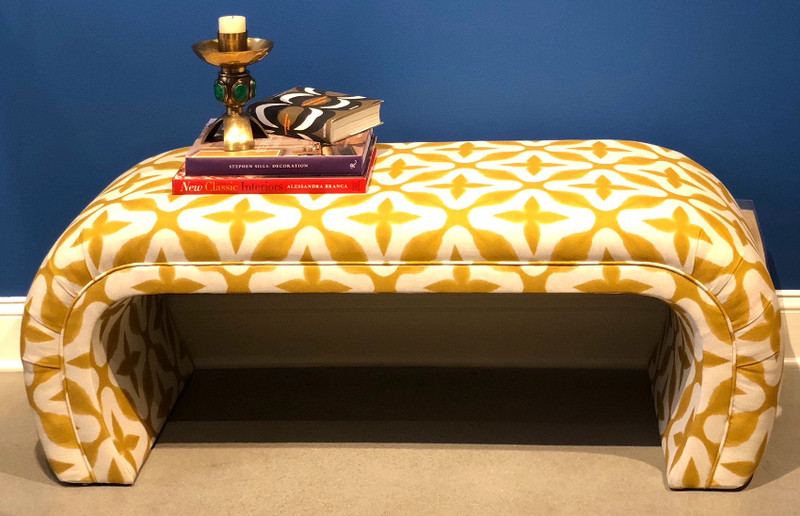 I loved the curved base on this bright yellow bench. 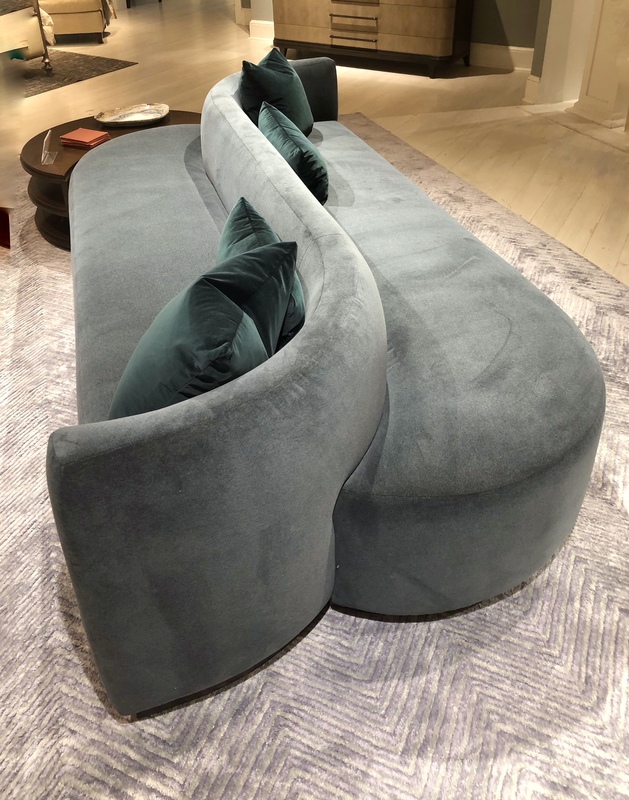 This velvet two sided sofa below was another example of the modern curved line design. 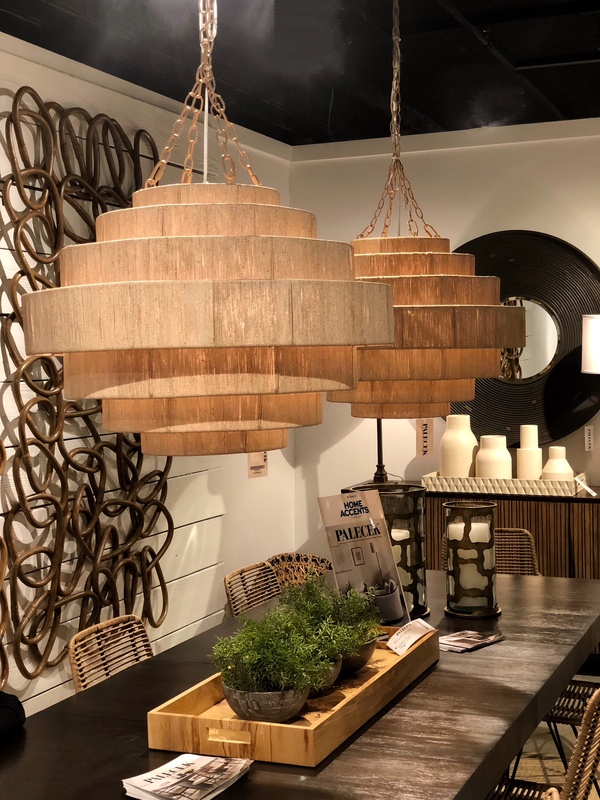 Raw wood, rope, stone, wicker, cane and even string was trending for both furniture and lighting. 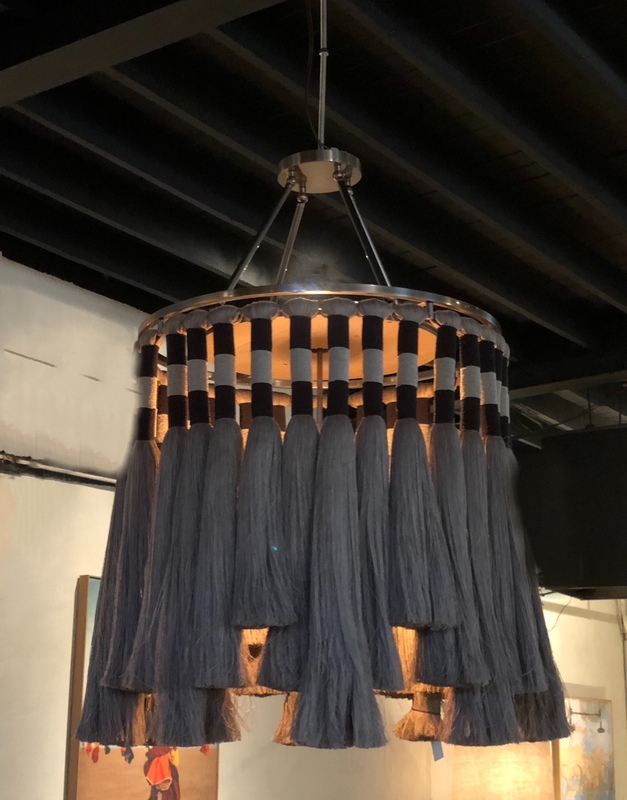 Fabric and natural fibers used for lighting always makes me pause because I think about the fire safety but I’m sure the light meets all safety requirements. 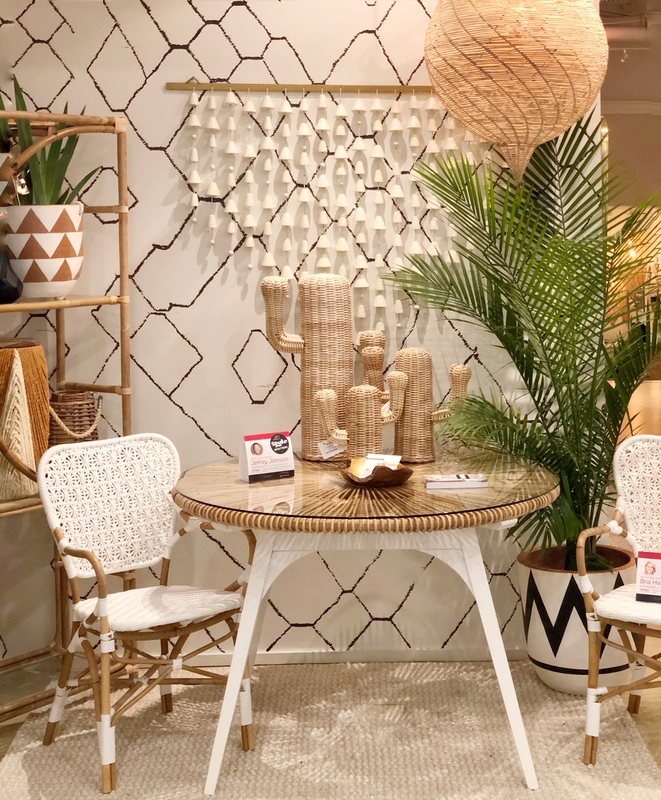 Wicker and cane used for both furniture and lighting was very prevalent. I couldn’t help but think of the 70’s all over again. 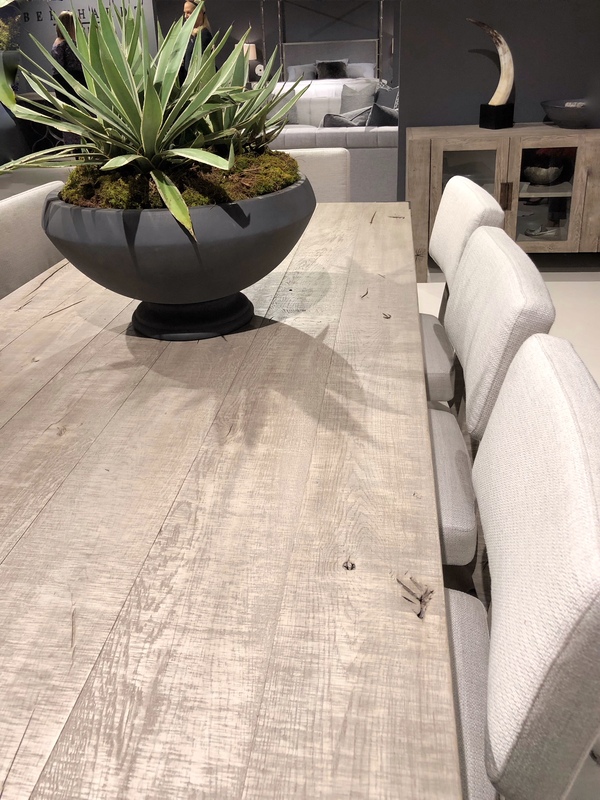 Natural wood is once again on trend. I saw much less painted pieces and much more natural wood. Much of the wood was cerused, bleached or very light but I saw some traditional brown furniture as well. Raw wood with clearly visible grain was definitely on trend this Market. 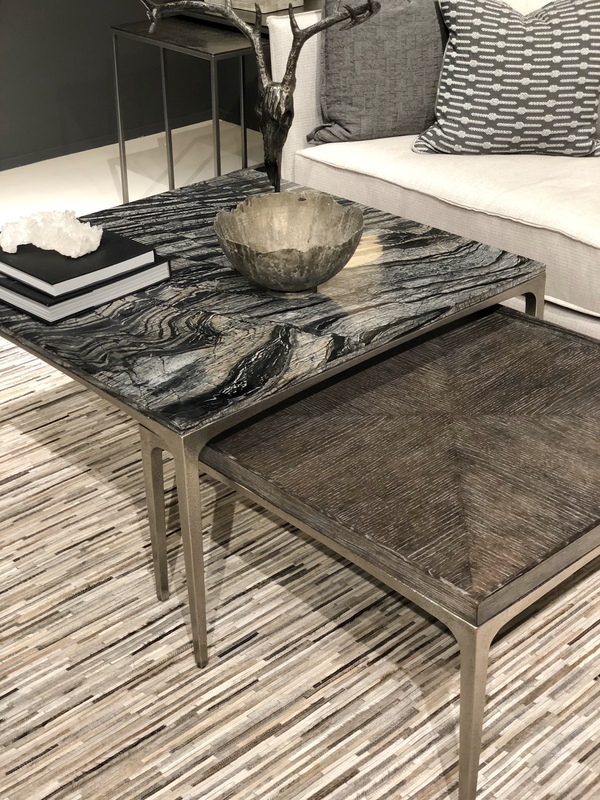 Unique pieces of wood and black marble was also very popular and made for beautiful statement pieces. 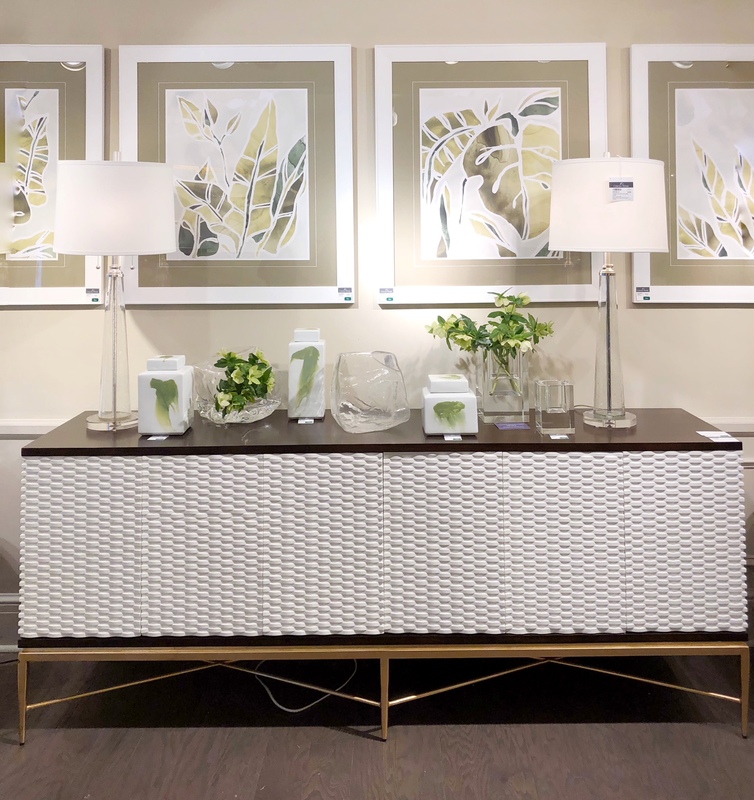 Geometric shapes and lines have been trending for awhile now and from what I saw at this past market they are still going strong. It all plays into the texture trend but geometric lines were especially popular on case goods. 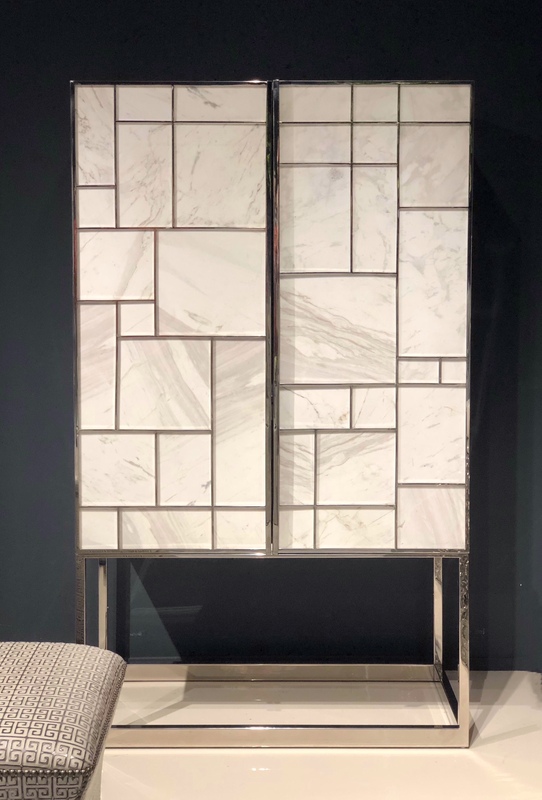 This Mondrian inspired chrome and marble faced cabinet was a stunner. 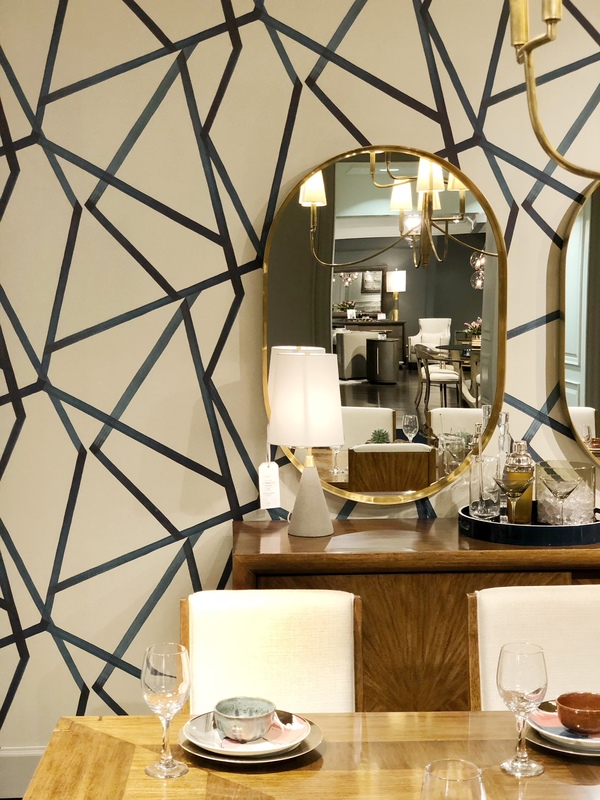 Not limited to furniture, bold geometric lines in wallpaper is also trending. So there you have it. 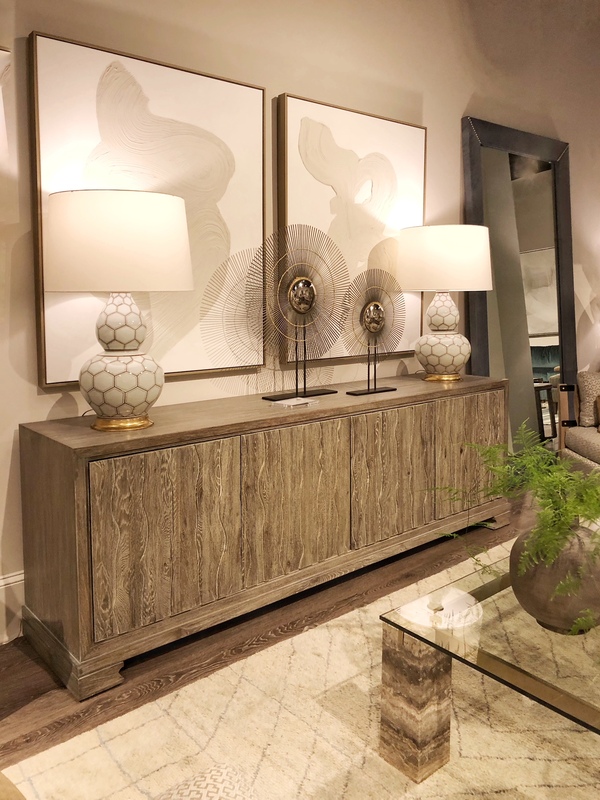 Five trends that will soon be showing up in your local furniture and decor stores. Which trend is your favorite? Loving all these trends, especially the wood and rope. Natural elements in interiors always speak to me. Totally agree Carla. I am loving the more natural and organic pieces. 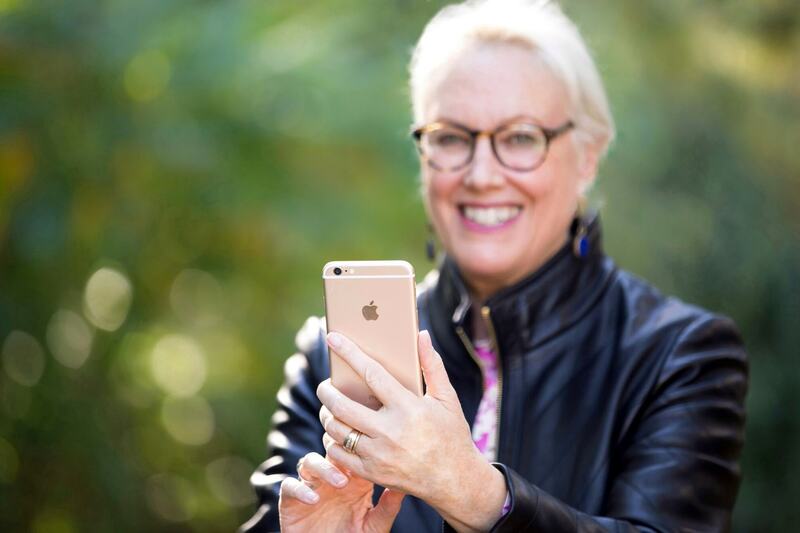 Linda, thanks for the recap of your High Point trip! I remember seeing a lot of those same trends when I was there in October. Look forward to seeing more of these in retail! Thanks Kristie, I agree, the trends didn’t seem like too much had changed I just saw more of it. 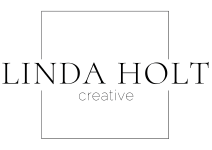 Linda, great report on the top trends you saw in High Point. And fabulous images! I recognize a few but would love to know where you saw these products! Hi Patricia, The Photos were from all different showrooms. If there is something in particular you want to know about I will do some research and let you know the vendor. It’s a really informative topic. You share the information is really helpful. Great!